Sour cream and brown sugar make the simple fruit topper in this dessert. In a small bowl, stir together the sour cream and 1/4 cup brown sugar until a smooth cream forms. Divide blueberries among 6 stemmed sherbet dishes or dessert dishes. 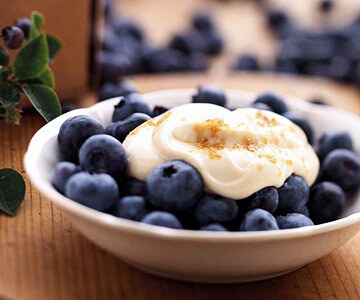 Spoon sour cream mixture over blueberries. If you like, sprinkle with additional brown sugar. Makes 6 servings.